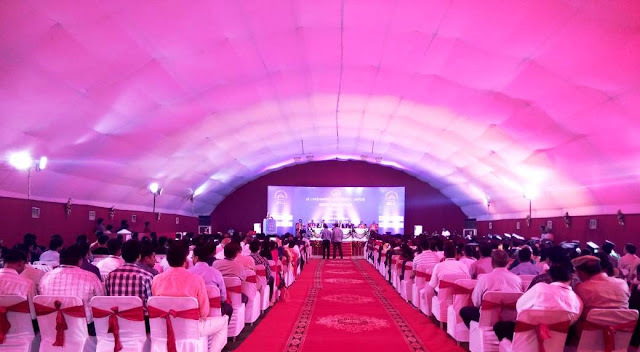 Jaipur/New Delhi, 4 th June, 2018: With innovative learning-by-doing educational initiatives being hailed by both industry and academia as a ground breaking concept, experiential learning pioneer, JK Lakshmipat University, Jaipur celebrated the graduation of its newest batch of graduates by hosting its 6th convocation ceremony. Former Chief of the Atomic Energy Commission, Dr. Anil Kakodkar, currently President National School Of Sciences, was the chief guest on the occasion. The organizers felicitated more than 123 students for successfully completing their graduate, post-graduate and PhD courses. On the occasion, the University also inaugurated its two new Centres of Excellence - The Centre for Operations Excellence and the Centre for Data Sciences. The Centre for Operations Excellence will be a multi-disciplinary centre with capabilities in supply chain, manufacturing and service operations. To begin with, the centre will offer expertise in four areas: Powerful diagnostics,Capability Building Workshops, Operations Excellence Assessment and benchmarkingand Facilitation for Global Awards such as Deming Grand Prize and TPM Excellence Award. The Centre will be led by Dr. Yugal Nauhria, Assoc. Professor, who brings versatile experience of consulting with clients in leading organisations including KPMG and McKinsey & Company as well as line management experience from organisations like Ola and Flipkart. The Centre for Data Sciences reflects JKLU’s focus on emerging areas which are impacting business and work across sectors. The centre has competencies in Data Cataloging, Capability Building for Data-Driven Culture, Analytics Solutions and data science approachesin areas such as fraud analytics, sensor analytics, business intelligence, resource optimization, investment modelling, marketing analytics, big data technologies, predictive analytics, machine learning, IoT streaming analysis and many more. The Centre will be led by Dr. Alok Kumar, Assoc. Professor, who has rich professional experience in Data Science Consulting, Developing Data Products, Big Data Implementation, Big Data Visualization, Data management and maintenance including as Data Science Consultant at UGhent, Belgium. In addition to these the University also has a Centre for Entrepreneurship & Innovation and a Centre for Communication & Critical Thinking, which have been working very closely with the students. Established in 2011, JK Lakshmipat University (JKLU) has consistently managed to deliver transformative pedagogical techniques to its students based on a model that allows learners to be curious, draw conclusions based on previously taught lessons and most importantly, reflect on the experience to consolidate the module in memory. Speaking on the occasion Dr. Anil Kakodkar President National School Of Sciences, India observed that contrary to Western beliefs, India had been “producing innovators and creative thinkers throughout its history”. Mr. Kakodkar added, “There does exist a market willing to absorb fresh graduates with new and radical ideas. JKLU students were blessed to have been taught by global faculty and have therefore acquired global perspectives.” He further emphasized that students need to get passionately involved in converting challenges into opportunities and find ways to “use technology and innovation in alleviating human suffering while creating wealth and prosperity for all”. He urged students to persevere in their studies and search for solutions because “learning is a lifelong journey whereas giving up is a permanent state of stagnation”. Four students were awarded gold medals to recognize their excellence and hard work – Tanushka Jangid received the gold medal for Best Student in MBA; Tanuj Kumar was awarded the gold medal for Topper in Computer Science Engineering; Gaurav Mishra was awarded the gold medal for Topper in Mechanical Engineering; Karan Gupta received the gold medal for the Best Student in Bachelor of Technology. Congratulating the graduating students, Dr. R.L. Raina, Vice Chancellor, JKLU said, “We have come a long way since 2011, when this experimental model first began. Today, JKLU is being accepted as an exceptional private university in national circles with demonstrable examples of high quality research”. He added, “Quality higher education contributes to economic growth and human development simultaneously. At JKLU, we are striving to develop world class research and learning exercises that are directly impact society and remain globally relevant,” he concluded.